Do you want be more courageous, fulfilled and authentic in your life, but you feel like fear, anxiety, stress and self-worth are holding you back? Are you struggling with self-doubt and don’t even know who you are anymore? 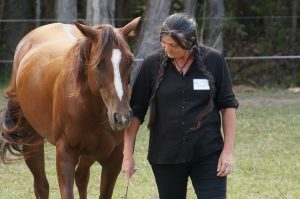 Let horses be your guides on your journey to awakening your authenticity and finding your true self. Horses are powerful teachers because they are always authentic in their self-expression towards others. This workshop will give you a non-judgmental, hands on healing and personal growth experience, opening the door to your authenticity, self-love and a deeper understanding of who you are. During this transformative 2-day Workshop you will be guided through unique activities that are focused on developing and cultivating authenticity in your daily life. Experience or knowledge of horses is not required. Even people with a fear of horses can benefit from this work. All activities are done from the ground. No horse back riding in this workshop. This workshop is recognised worldwide as an introductory Eponaquest workshop. Completing this workshop qualifies you to participate in any advanced Eponaquest workshops worldwide as well as being a prerequisite for the Eponaquest apprenticeship. It also qualifies you to participate in any of Skerrett Equine’s advanced workshops. Exploring a passion for personal development led Ben to the knowledge, that horse training was more about training people and less about training horses. As a result of this knowledge Ben decided to become a qualified Eponaquest Equine Facilitated Experiential Learning (EFEL) instructor, and a Riding Focused Instructor (RFI). Ben has also completed a diploma in counselling from the National Education Academy. Note: If you would like to pay with credit card, please select the PayPal options below. Once you are redirected to the PayPal site you can choose “Pay with card” and follow the instructions.